A throwout bearing is used to apply force against the clutch pressure plate to release the clutch and should be replaced as part of the normal clutch job. It is a good idea to see how a throwout bearing works in its relationship to the clutch so you can fully understand it's importance. 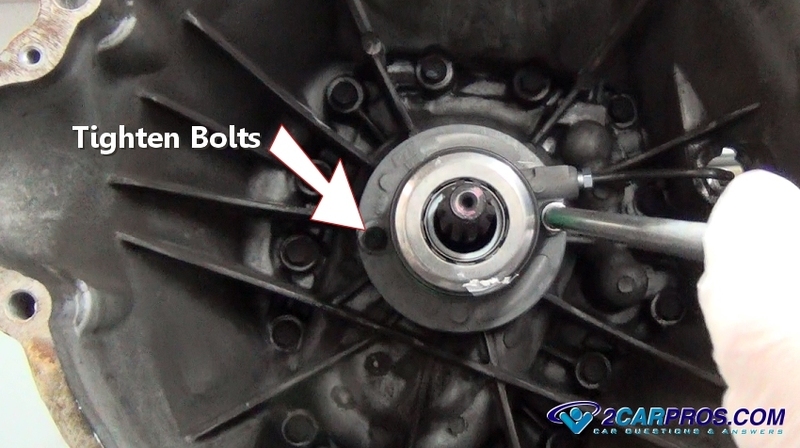 When this bearing goes out it will cause a squeaking noise when the clutch pedal is depressed. This noise is letting you know the bearing is locking up and destroying the pressure plate which will lead to a clutch operation failure. The parts cost of a throw out bearing will vary depending on if the bearing is serviced separately or together with the slave cylinder. The cost for the bearing on Amazon ranges from $15.00 to $45.00 (US). A bearing and slave cylinder combo will run about $160.00 (US). The big expense in doing this job is removing the transmission which will run between $450.00 and $750.00 depending on if the car is front wheel or rear wheel drive. This is why you will want to replace this bearing anytime you are replacing the clutch assembly. Replacing the bearing is fairly simple, getting to the bearing is the tough part. To begin the throwout bearing replacement you must first perform the following jobs to access the bearing. 1. Throwout Bearing Removal: The throwout bearing sits inside of the transmission's bell housing and is held in place by a clutch fork or a slave cylinder. In the case below there are two 10mm bolts which must be undone to release the bearing and slave from the bell housing. 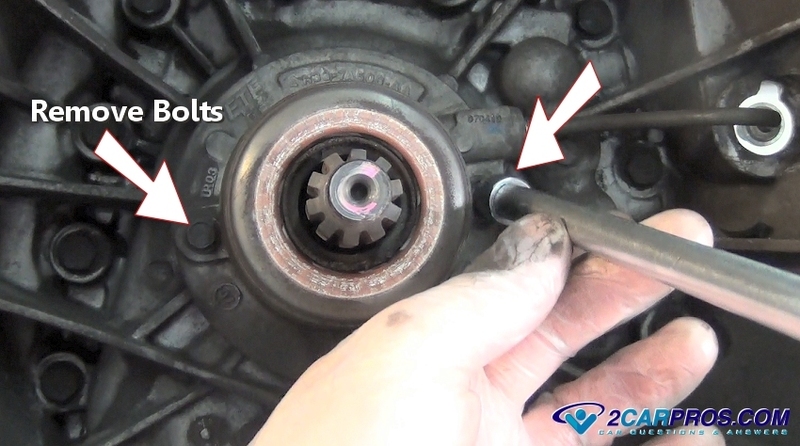 After removing the bolts grasp the bearing firmly and pull outward from the input shaft bearing retainer. You may need to remove a plastic clip which supports the hydraulic clutch line. At this point the bearing may already be in pieces if it has failed be sure to remove all remaining bearing parts. 2. Match the New Bearing: Remove the new throwout bearing from the box and place it next to the old bearing. 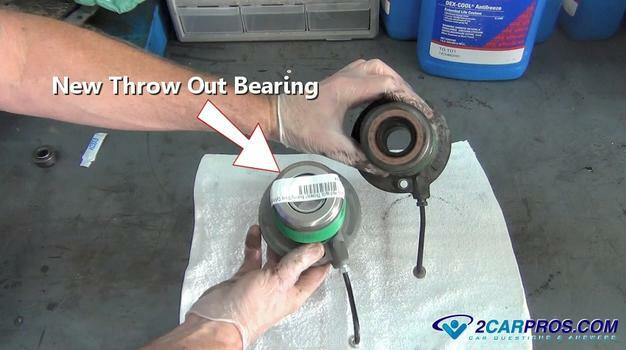 Check the inner and out diameter of the bearing to make sure they are the same. Also check the height of the bearing because if the bearing is too thin the clutch pedal will have too much play and may not release the clutch fully. 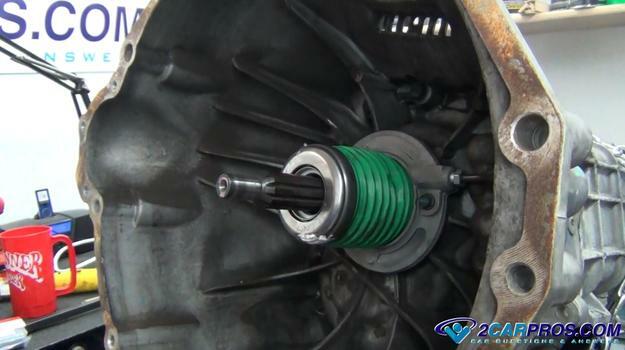 If the bearing it too thick it will not allow the clutch to fully engage. 3. 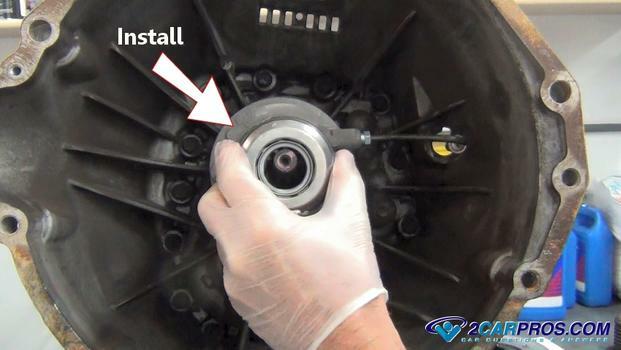 Install the New Throwout Bearing: Before installing the new bearing use carburetor cleaner and clean the sliding surface of the bearing retainer. Once the surface is clean apply a small amount of grease to the input shaft bearing retainer to allow the throwout bearing to slide freely. This lubrication will help the bearing to operate smoothly. If the bearing is being held in be a clutch fork lube the two fingers and pivot of the fork. 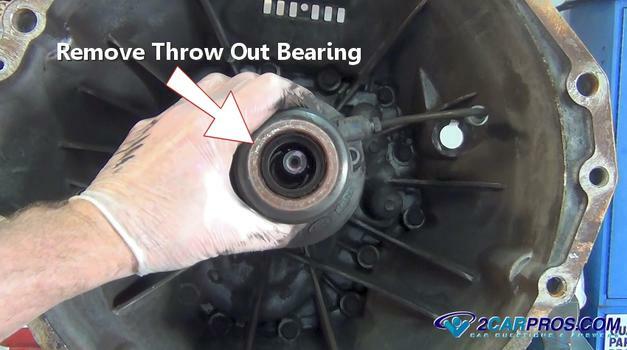 Do not install a throwout bearing dry or it will cause the bearing to seize hindering the clutch operation. It will also make the clutch pedal hard to push downward. While feeding the hydraulic line through the bell hosing push the throwout bearing assembly against the input shaft bearing retainer. Then reinstall the mounting bolts by hand to avoid cross threading. Using a socket and ratchet evenly tighten the mounting bolts to factory specifications which is usually 7 to 10 foot pounds. Reinstall any plastic clips that were removed in the process. Spin the bearing by hand to make sure it moves freely and with no irregular noises. The new bearing and cylinder is ready for the transmission to be reinstalled. 4. Refill Clutch Fluid: If the throwout bearing was replaced with the slave cylinder the clutch fluid will need to be refilled. 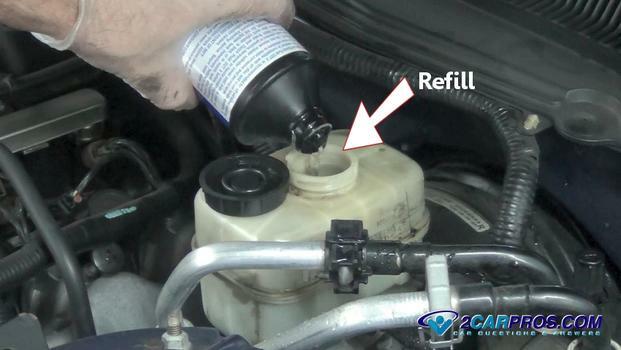 Remove the cap to the fluid reservoir under the hood of the car and add brake fluid (brake fluid is the same as clutch fluid) to the full line and reinstall the cap. Some vehicles use the brake master to supply fluid to the clutch master and slave cylinders. 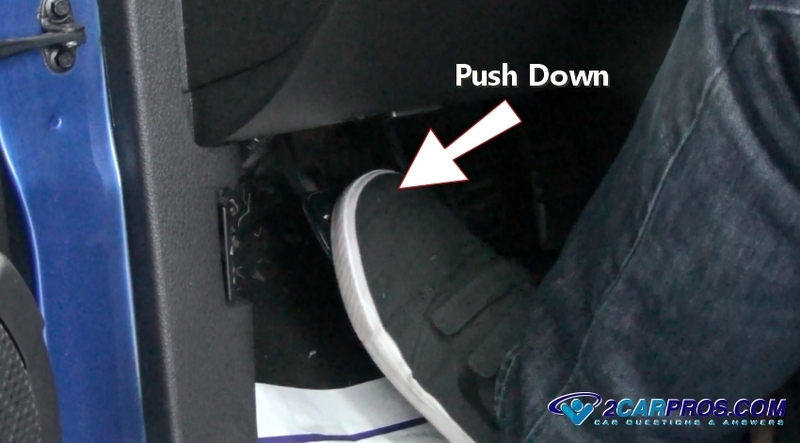 When the job is complete you will need to pump the clutch pedal several times to adjust and bleed the system. There is no bleeder screw used on the salve cylinder. Because of the location of the slave cylinder the system will self bleed as air bubbles naturally rise to the top and out into the clutch master cylinder reservoir. Recheck the fluid level throughout this process. Continue to pump the pedal until normal pedal operation returns and you are all set. 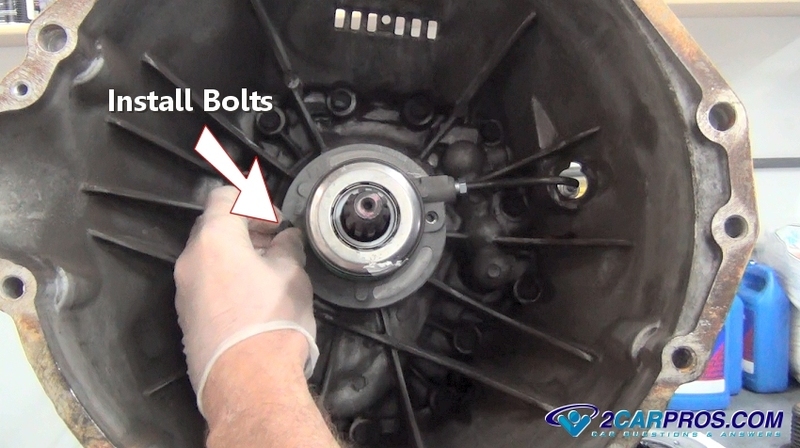 Here is a complete clutch replacement video which includes the throwout bearing. If you have any questions about a throwout bearing please visit our forum. If you need car repair advice, please ask our community of mechanics who are happy to help. Our service is always 100% free.